Peel the bottom part of the asparagus and then trim the cut end. Cut the stalks in half. Add the egg yolks to the butter and use an immersion blender to emulsify the mixture until it's all a uniform color. With the blender running, slowly pour the boiling water into the egg yolk mixture. Add the lemon juice and salt and blend to combine. Stir in the chervil by hand and keep the hollandaise sauce warm in a double boiler set over warm water. Don't heat the hollandaise or it will cook and get lumpy. If this happens, you might be able to save it by whisking in a bit of water. In a pan that's just big enough to hold the salmon and asparagus in a single layer, bring the white wine to a full boil and continue to boil until it no longer smells like alcohol. Add the vegetable stock and salt and bring to a boil. Make sure there enough liquid in the pan to cover the salmon, if there is not, add more stock or water and return to a boil. Add the salmon fillets and asparagus, return to a boil, and then cover the pan and turn off the heat. The salmon is done when it flakes easily (about 7-10 minutes). Transfer the salmon and asparagus to a plate lined with several sheets of paper towels to remove any excess water. 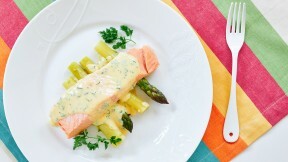 Plate the asparagus and salmon and drizzle with the warm hollandaise sauce. Garnish with chervil.